Authorities say a Stevensville man attacked by a grizzly bear is in stable but serious condition. The man, whose name has not been released, remains hospitalized in Seattle with non-life-threatening injuries, said Andrea Jones, information and education manager with the Montana Department of Fish, Wildlife and Parks in Bozeman. The 47-year-old man was hunting in the CentennialValley with his father on Sunday when he was mauled by a 10-year-old male grizzly. A crew of wildlife officials found the bear dead of a gunshot wound. The hunter’s father reported hearing a gunshot just before finding his son with serious injuries. An investigation into the incident remains active. On Monday, a team of officials, including a bear specialist, game wardens and people with the Forest Service to the remote area where the attack occurred. The Stevensville man and his father were hunting black bear in the Fish Creek Lake area in extreme southwestern Montana when the attack happened. Jones said the mauling happened five miles from their campsite in rugged terrain. Once stabilized, the man was eventually flown to Seattle. This entry was posted in Bears and tagged "sportsmen", Grizzly bear, Montana by Exposing the Big Game. Bookmark the permalink. Doubtful. Why should he–he had a gun and the right to shoot any bear that looked crossways at him. All he would have to do is say the bear was “threatening” him. I’m sorry that the bear was murdered. Did he shoot the grizzly thinking it was a black bear, the pissed off grizzly turned on him? 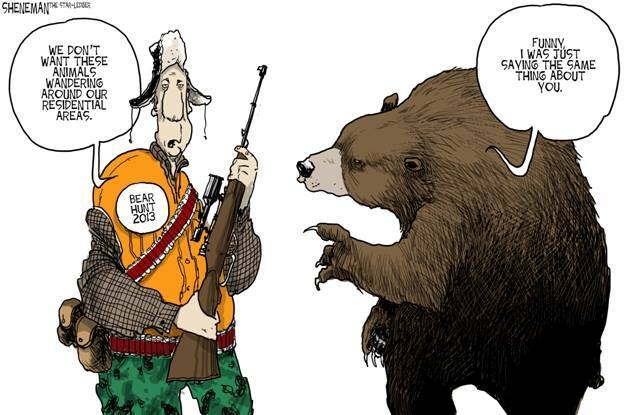 Or, did he shoot the grizzly in self-defense? Any any case it can be safely deduced the grizzly felt threatened. It is bear country. The bear was murdered in the sense that hunting bears has the inherent risk, in grizzly country of accidentally or in self-defense having to kill a grizzly. Then there is the inherent risks of hunting. Hunters kill about 100 of each other every year. Montana hunters kill around 1100 black bears every year. I find it difficult to feel sorry for blood sport enthusiasts. So score one for the bears. It seems that hunting bears in grizzly country results in hunting “accidents” on a regular basis. Grizzlies fight back. I feel sorry for the 10 year old grizzly not the hunter. You can’t say a hunter was ‘attacked’ when he goes out looking to kill a bear and threatens the animal. It’s an assumed risk. You could say the bear fought back to save his or her own life, as we all would if we were attacked by someone with a weapon. Someone who happened upon a bear accidently might be different, although one should be cautious when out hiking. Looking forward to that rare story where the victim lives and the killer dies, instead of the other way around. Great sticker, I want one!